2013 is Fernando Alonso’s fourth season with Ferrari. He joined the famous Italian team for the 2010 season, replacing 2007 World Champion Kimi Raikkonen, and it looked like titles would inevitably follow without too much delay. But that has not happened. Alonso has now finished second twice (2010 ad 2012) and fourth once in the World Championship for Ferrari, but has not managed to triumph over Red Bull and Sebastian Vettel. Alonso’s last title came with Renault in 2006, which will make this his seventh consecutive season as a runner-up or worse since last taking the crown, assuming he does not win the 2013 title. Alonso is not happy that his Ferrari is off the pace of the front-running Red Bull, Mercedes and Lotus cars, and it is only logical that his patience should be wearing thin after a number of seasons spent playing catch-up to Red Bull. Rumours surfaced over the weekend that Alonso could find a way out of his Ferrari contract and switch to World Champions Red Bull. Alonso’s manager, Luis Garcia Abad, was seen talking to Red Bull Team Principal Christian Horner during the Hungarian Grand Prix weekend, and that has fueled the rumours that Alonso is negotiating a contract with Red Bull. 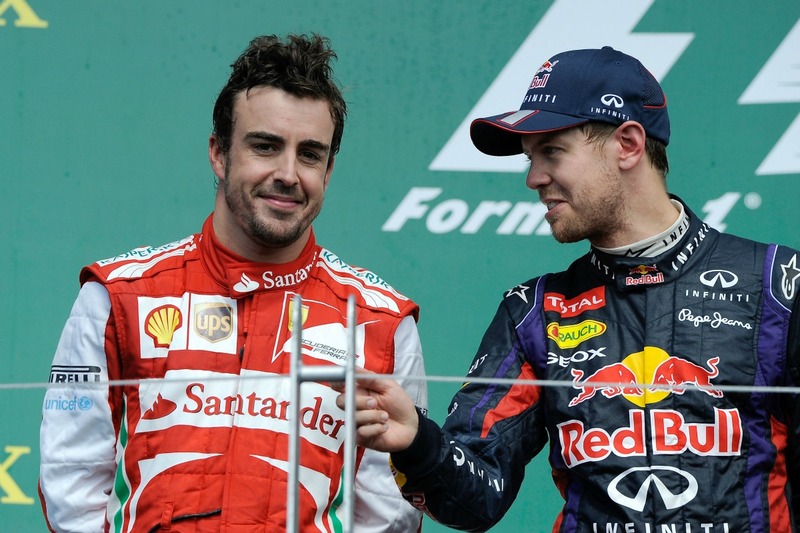 There has long been speculation that Sebastian Vettel might end up partnering Fernando Alonso at Ferrari. But now it looks like there is a real possibility of that same driver pairing at Red Bull. There is certainly a seat available at Red Bull. Mark Webber’s announcement that he is leaving Formula One to compete in the World Endurance Championship has ensured that Red Bull must employ someone to take his place in 2014. Alonso is arguably the strongest candidate for the seat, assuming he can find a way out of his Ferrari contract. But no contract in Formula One is ever entirely watertight. There are often performance clauses, particularly in the case of top drivers like Alonso, that allow for early termination in the case of the team not providing competitive enough machinery. And even if those clauses don’t exist, anything is possible when enough money changes hands. Alonso’s own arrival at Ferrari was dependent on Kimi Raikkonen terminating his Ferrari contract early, which the Finn duly did when Ferrari paid him out. The prospect of Alonso and Vettel in the same team is mouth-watering. It would be reminiscent of Alonso and Hamilton at McLaren in 2007, or even perhaps Senna and Prost at McLaren in the late 1980s. But it could also be a big mistake for Alonso to head to Red Bull. Consider the example of Michael Schumacher. He joined the 2009 World Champion team, Brawn (which became Mercedes), for the 2010 season, expecting to be fighting for victories and the World Championship. But Schumacher’s comeback – in which he did not win a single race in three seasons – is a stark reminder that the past is not an accurate predictor of the future. Red Bull may have won the last three Drivers’ and Constructors’ Championships, and are probably on course to make it four in a row this season, but that does not guarantee they will be competitive at all in 2014. The technical regulations have been very stable over the past few seasons, which has helped Red Bull to extend their run of form for a few years, but next year’s regulations are quite different. The new engine regulations, which require the use of 1.6 litre V6 turbocharged engines, added to various changes in the regulations covering the bodywork and exhaust positioning, mark the most significant change in Formula One regulations since sweeping changes were made in advance of the 2009 season. 2009 saw a massive shake-up in the field as a result of the regulation changes, and there is every possibility that a similar shake-up will occur in 2014. If Alonso is expecting to walk in to Red Bull and challenge for the championship, he may be just as mistaken as Schumacher was when he thought he would challenge for the title with Mercedes. At this stage, the idea of Alonso heading to Red Bull is simply a rumour. Red Bull’s Christian Horner has refused to deny that he is talking to Alonso’s management, but no-one has categorically confirmed anything at this point. However, in Formula One rumours so very often turn out to be true, as was the case with Schumacher’s comeback in 2010 and Lewis Hamilton’s move to Mercedes at the start of 2013. As they say, where there’s smoke, there’s fire. In the case of Alonso and Red Bull, the extent of the fire is not yet clear.